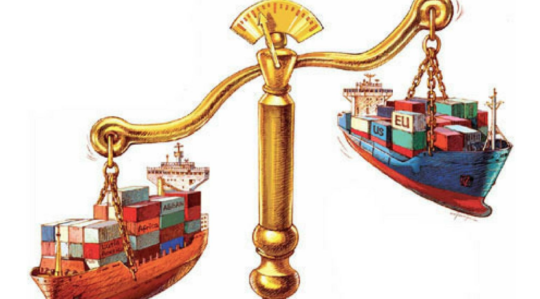 WITA > Do Trade Deficits Matter? Trade policy and a focus on bilateral trade deficits has moved front and center in the public debate about the American economy. On March 31st, the same day that President Trump is issuing his Executive Orders on trade enforcement and trade deficits, WITA hosted an event that looked at the significance of trade deficits to our overall economy. A panel of experts debated whether bilateral trade deficits are a measure of an effective trade policy and if they should they drive a renegotiation of existing trade agreements. They helped WITA members understand the underlying issues and arguments about the importance of bilateral trade deficits in charting a new course for U.S. trade policy. Caroline Freund, senior fellow at the Peterson Institute for International Economics since May 2013, is on leave for public service as director of trade, competition and investment climate at the World Bank. Previously she was chief economist for the Middle East and North Africa at the World Bank, after working for nearly a decade in the international trade unit of the research department. She has also worked in the research departments of the International Monetary Fund and the international finance division of the Federal Reserve Board. Freund’s research examines international trade, trade policy, and economic growth. She is the author of Rich People Poor Countries: The Rise of Emerging Market Tycoons and their Mega Firms. She has published many articles on the effects of regional trade agreements and edited a volume on The WTO and Reciprocal Preferential Trading Agreements. Her work has appeared in academic journals, including: American Economic Review, Quarterly Journal of Economics, Review of Economics and Statistics, Journal of International Economics, and Journal of Development Economics. Freund was a member of the EXIM Bank advisory committee from 2014 to 2016. She is on the scientific committees of CEPII (Institute for Research of the International Economy, Paris) and the Economic Research Forum (Cairo), is a member of the Centre for Economic Policy Research, and on the editorial board of the journal Economics and Politics. She received a PhD in economics from Columbia University. Professor Emeritus Peter Morici is a recognized expert on economic policy and international economics. Prior to joining the university, he served as director of the Office of Economics at the U.S. International Trade Commission. He is the author of 18 books and monographs and has published widely in leading public policy and business journals including the Harvard Business Review and Foreign Policy. Morici has lectured and offered executive programs at more than 100 institutions including Columbia University, the Harvard Business School and Oxford University. His views are frequently featured on CNN, CBS, BBC, FOX, ABC, CNBC, NPR, NPB and national broadcast networks around the world. Dr. Robert Shapiro chairs Sonecon, and is also a Senior Fellow of the Georgetown University School of Business, advisor to the International Monetary Fund, director of the Globalization Center at NDN, chairman of the U.S. Climate Task Force and co-chair of America Task Force Argentina. From 1997 to 2001, Dr. Shapiro was U.S. Under Secretary of Commerce for Economic Affairs. In that position, he directed economic policy for the Commerce Department and oversaw the Nation’s major statistical agencies, including the Census Bureau while it planned and carried out the 2000 decennial census. Prior to that appointment, he was co-founder and Vice President of the Progressive Policy Institute. He also served as principal economic advisor to Bill Clinton in his 1991-1992 presidential campaign and senior economic advisor to Al Gore and John Kerry in their presidential campaigns. In 2008 and 2012, he advised the campaigns and transition of Barack Obama. Dr. Shapiro also was as Legislative Director for Senator Daniel P. Moynihan and Associate Editor of U.S. News & World Report. He has been a Fellow of Harvard University, the Brookings Institution, and the National Bureau of Economic Research. Dr. Shapiro holds a Ph.D. and M.A. from Harvard, a M.Sc. from the London School of Economics, and an A.B. from the University of Chicago. He is widely published, and his most recent book is Futurecast: How Superpowers, Populations and Demographics Will Change the You Live and Work (St Martins’ Press, 2008). Moderator: Ambassador Peter Allgeier has forty years of experience in negotiating international trade and investment issues, in both government and the private sector. At the Office of the U.S. Trade Representative, he served as the Deputy USTR and as U.S. Ambassador to the World Trade Organization (WTO), also serving twice (2005, 2009) as Acting US Trade Representative. Before his appointment as Deputy USTR, he served in a series of senior negotiating positions covering Asia, Europe, the Middle East, and the Western Hemisphere. From 2012-2016, Ambassador Allgeier served as President of the Coalition of Service Industries (CSI), representing the international trade and investment interests of the American service economy. including major international companies from the banking, insurance, telecommunications, information technology, express delivery, audiovisual, energy services, and other service industries. Prior to his leadership of CSI, he served as President of C&M International, a trade consulting firm based in Washington, DC. He is the recipient of the Distinguished Service Award from the Washington International Trade Association (WITA) and the Woodrow Wilson Distinguished Alumnus Award from Johns Hopkins University School of Advanced International Studies (SAIS). He has a Ph.D. in International Economics from the University of North Carolina at Chapel Hill; an MA in International Relations from Johns Hopkins University, and an A.B. in International Relations from Brown University. Ambassador Peter Allgeier has forty years of experience in negotiating international trade and investment issues, in both government and the private sector. At the Office of the U.S. Trade Representative, he served as the Deputy USTR and as U.S. Ambassador to the World Trade Organization (WTO), also serving twice (2005, 2009) as Acting US Trade Representative. Before his appointment as Deputy USTR, he served in a series of senior negotiating positions covering Asia, Europe, the Middle East, and the Western Hemisphere. From 2012-2016, Ambassador Allgeier served as President of the Coalition of Service Industries (CSI), representing the international trade and investment interests of the American service economy. including major international companies from the banking, insurance, telecommunications, information technology, express delivery, audiovisual, energy services, and other service industries. Prior to his leadership of CSI, he served as President of C&M International, a trade consulting firm based in Washington, DC.